This week was a rough one, so I didn’t make as many complicated items. Thankfully I am able to switch recipes around so that I could take it a little easier this week. In the future weeks I will probably be making a couple more changes to some of the recipes just due what kind of foods people are craving. I am so happy that this week is over. This is a family recipe and it is so delicious. Adding in dried onion flakes really adds some additional flavouring to the dip. I really like dipping all kinds of veggies into this dip. This dip takes minutes to make and it is always better to leave in the fridge for 30 minutes before enjoying. In the summer this is a staple in our fridge. This recipe takes a while to make since you have to reduce the stock to add the flavour. Then you slowly add in all the other ingredients into it. Next time instead of simmering the chicken in chicken stock, I would crisp up the chicken and then cook in the chicken stock. Eating white chicken is a little strange to me. The overall flavour was very very good. I do wish that I would have used a little less lime juice since it had a very strong lime flavouring. I was so happy that the tortilla crisps turned out crispy and chip like. Perfect addition to the top of the soup. In a large saucepan over high heat, bring 3 1/2 qt of the stock to a boil. Reduce the heat slightly and boil gently until reduced to about 7 cups, about 30 minutes. Pour the oil to a depth of 1 1/2 inches into a deep saute pan and heat to 375 degrees. Working in batches, drop the tortilla strips and fry until golden and crisp, about 2 minutes. Using a slotted spoon, transfer to paper towels. In a saucepan, combine the chicken breasts and the remaining 2 cups stock, bring to a simmer and cook until chicken is opaque throughout, about 8 minutes. Transfer chicken to a cutting board and cut into bite sized pieces. Set aside, reserve the stock. In a large saucepan over medium heat, warm the olive oil. Add the onion and saute, stirring occasionally, until translucent, about 10 minutes. Add the garlic and the child to taste and cook for 1-2 minutes. Add the reduced stock, raise the heat and bring to a boil. Reduce the heat to low, add the chicken, tomatoes, cilantro, and lime juice. Season with 1 1/2 tsp salt and 1/2 tsp pepper and simmer until chicken is heated through, about 5 minutes. Taste and adjust seasoning. Ladle the soup into warmed bowls and garnish with the tortilla strips. This recipe was brought to me by a family friend. I was excited to see this since I really like pickles. I decided to make them and then take them to the person who shared the recipe with me, so she could try them too. I was hoping that it would taste more like pickles but it was very subtle, I ended up making a vanilla frosting to balance out the pickle flavouring. I wish I would have made a pickle juice frosting to add more pickle. Overall the flavouring was so good. I was thrilled to see that so many people really liked the pickle cupcakes. I would definitely make these again in the future. Preheat oven to 350° and line a cupcake pan with cupcake liners. In a medium bowl, whisk together flour, baking powder, and salt. In a large bowl, cream together butter and sugar. Add the eggs and beat until combined. Add sour cream and pickle juice and beat until evenly mixed. Then stir in the flour mixture and chopped pickles until just combined. Scoop about a ¼ cup of the batter into each cupcake liner and bake until a toothpick inserted into the middle of the cupcake comes out clean, about 20 to 25 minutes. Let cool completely. Meanwhile, make the frosting: In a large bowl, beat together butter and cream cheese until light and fluffy. Add the powdered sugar, bourbon and salt and beat until smooth. Spread frosting onto each cupcake and garnish with a pickle slice. Since my Dad was wanting ice cream, I found a recipe for some and decided to try and make it. It is so nice to make a quick ice cream with frozen fruit and a little bit of milk and vanilla. You can add any kind of frozen fruit to a blender with some milk and vanilla and surprise you have ice cream. I put mine into the freezer to thicken up a little since I don’t like soft ice cream. Using frozen fruit really helps make it look more like an ice cream. I would totally do this again since it is really quick and simple with healthy ice cream. Place frozen bananas and frozen cherries in a heavy duty blender or food processor. I used a food processor. Press the button and let blend until smooth and creamy. Garnish with coconut flakes and cacao nibs for a delicious crunch. I didn’t make my own dough this time around, but next time I definitely will be making my own. Making the filling was really easy, I cut back the sugar since I wanted to make it a little healthier. After baking the pie it looks more like a gratin since it shrunk so much more than I thought it would. But with all the flavours of an apple pie it was so good. Next time I would put all the filling into one pie crust even if it is really full, that way it would be fuller than it was. To make the pastry, in a food processor, combine the flour, sugar, and salt, and process briefly. Scatter the butter and pulse until the mixture resembles coarse meal. In a small bowl, whisk together the egg and 3 tbsp ice water until blended. With the processor running, gradually add the egg mixture and process until moist clumps form. Add more ice water by tsp if the dough is too dry. Foam into a ball and divide in half. Flatten half into a disk. Wrap separately in plastic wrap and refrigerate for at least 1 hour. Position a rack in the lower third preheated oven to 400 degrees. 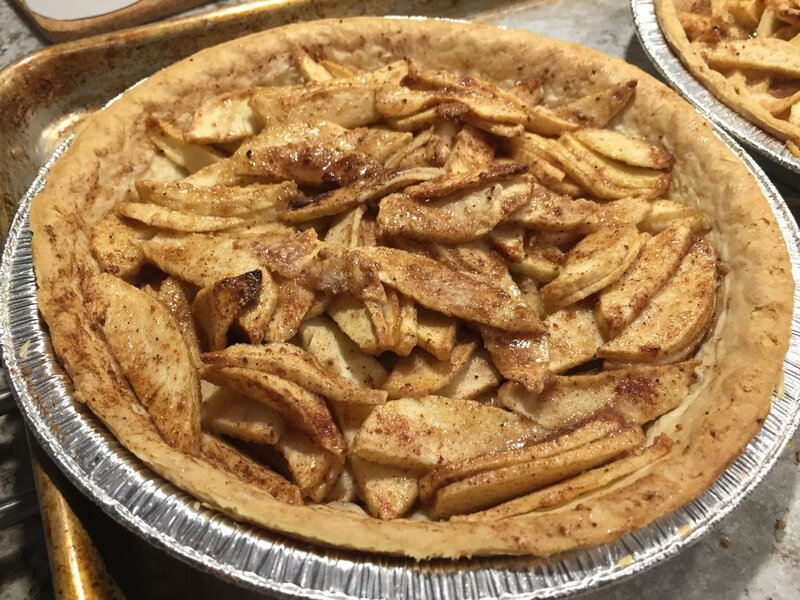 To make the filling, in a large bowl, combine the apple slices, sugar, flour, cinnamon, and nutmeg. Toss to mix well. Place 1 dough disk between sheets of waxed paper and roll out into a round 13 inches diameter. Transfer the pastry to a pie pan 9 inches and gently press into the pan. Trim the overhang. Brush the edges lightly with water. Transfer the filling to the pie shell, mounding it slightly in the center. Roll out the second disk. Place atop of the filling and trim the overhang. Fold the top crust edge under the bottom crust edge, press and rip decoratively, then cut 4 or 5 slits in the top for steam vents. Place the pie on a baking sheet, and bake for 45 minutes. Meanwhile, make the glaze. In a small bowl, stir together the sugar, cinnamon, and nutmeg. After the pie has baked for 45 minutes, remove it from the oven. Brush the top crust with the milk, then sprinkle evenly with the sugar mixture. Return to the oven and bake until the crust is golden brown and the apples are tender when tested through a vent, about 20 minutes longer. Let cool on a wire rack. Serve warm or at room temperature. Since I haven’t been making smoothies as often as I have been wanting to, I decided it was time to make a smoothie. I made a strawberry banana smoothie with almond milk and a little bit of vanilla. I had my Dad try it and he even liked it, even though it was made with almond milk. Adding the vanilla really masks the almond flavouring and I think that is why he really liked it. I am glad I can hide the flavouring. I plan on making a smoothie every other day since they are really good for you. I made my own teriyaki sauce for the chicken and it was so good. It really smelt delicious while it was cooking. To pair with dinner tonight, we had brown rice and baked cauliflower. The chicken gets brushed in the teriyaki sauce, and then baked, but I baked the chicken in the left over sauce which really added more flavouring into the chicken. It was so good and I plan on making the teriyaki sauce and bottle it for later times. So good.